Kat Holloway is relatively young to be a sought-after cook. She has just taken a position in Lord Rankin’s Mayfair mansion and is beginning her first full day of duties when she stumbles across something in the pantry. Alas, the something turns out to be a dead someone, in the form of her own assistant, Sinead. Kat may just have met the young woman on the previous day, but she is determined to find the murderer. Kat’s hunt for justice is assisted by her friend, the mysterious Daniel McAdam, his mathematical genius chum, and Lord Rankin’s quirky, cross-dressing sister-in-law. 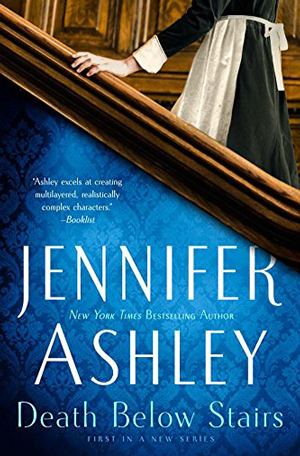 However, the mystery is a bigger one than originally meets the eye, and soon they are on the chase over a plot regarding the country that could endanger the Queen. DEATH BELOW STAIRS is said to be the first book in a new series. I understand that there is a novella which precedes this story, A SOUPÇON OF POISON, introducing our main characters. Though knowing more of the background between Kat and Daniel would give a richer read, it is not needed for the enjoyment of the first official installment of the series. The author writes with a deft hand, showing us the romantic undercurrents between hero and heroine, and alludes to a bit of history between the two. We will likely see the relationship build as the series progresses. Both of our main characters are strong, intelligent, and capable people. Each of them is a parent of a not-so-young child, with all of the joy and responsibility that holds. They share a mutual respect for one another. They also share a mutual fondness for each other, an open appreciation on Daniel’s part, and a bit of a hesitant fondness from Kat. And who could blame her for being guarded when the man might appear as a delivery man one day and as someone in a higher station of life the next? All the same, it would be hard to be completely immune what with that twinkle in his eye and the regard that colors his actions towards her. The actual mystery is built well with good pacing, unexpected twists, and an interesting cast of characters to keep our attention. This is a Victorian era mystery with a focus on the goings on of those below stairs and their perspectives of the “betters” in the house. The story shows the social mores and their ramifications of the time. For those who particularly enjoy the idea of peering into the behind-the-scenes efforts on meals for the aristocracy and that of the servants, it is quite a delicious view. DEATH BELOW STAIRS has the feel of a cozy but with more nuanced characters than I usually come across in the genre. It is a fascinating and fun read. The second installment, SCANDAL ABOVE STAIRS, is expected to be released in July this year. This gives me plenty of time to go back and read the prequel. I, for one, want all of the details on this mystery solving duo and look forward to reading Kat and Daniel’s next adventure!